Here’s the second batch of what I’ve taken to calling the “Field Only Armoury Project”, which is basically a grandiose way of saying I intend to depict all of the field-only devices currently in the SCA’s Ordinary & Armorial. You can read a bit more about the details of this little personal project at the first post in this series. 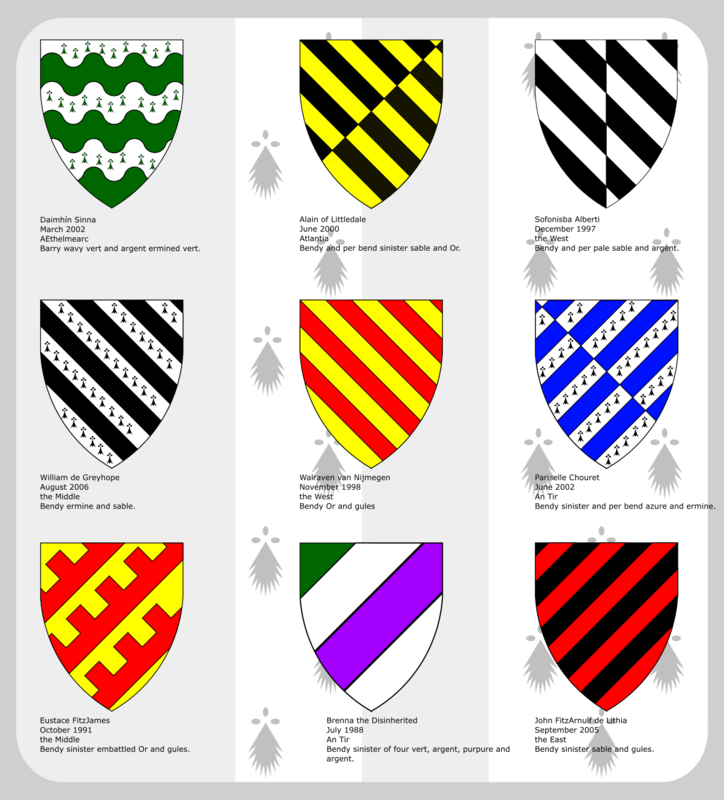 Incidentally, if the ordering of these seems a bit random, it’s actually alphabetical by the blazon (description) of each device, so we started with “Argent, chapé ployé per pale gules and sable.” and will eventually end up with “Vert scaly Or” at the bottom of the list of 165 devices in my spreadsheet. The text below each device is SCA Name, Date of Approval, Kingdom of Approval, Blazon (Description), and finally any Notes filed in the O&A for that device. Field Only Armoury, 2nd image of many! See text for details, click for much larger! We’re into the bendy (diagonal stripes) territory this time, with some really cool use of stacked field divisions in the devices of Alain of Littledale, Walraven van Nijmegen, and Pariselle Chouret. Lots of nice stripes! As always, if you have comments, corrections, or tales to tell of the holders of these devices, please comment below!